11th lunar month of 1717: he started his career in his native city of Kyôto, performing as an iroko in Sadoshima Saburôzaemon's kaomise drama "Iwao no Matsu Manbai no Midori", which was produced by Miyako Mandayû in his theater. His first stage name was Hayakawa Kokatsu. 1st lunar month of 1721: Kokatsu became wakashugata. 1st lunar month of 1723: Kokatsu played in Kyôto at Daikokuya Takenojô's theater the role of Ageya Kyôshichi in the new year drama "Keisei Hitomaruzuka" which was produced by Otowa Jirosaburô I. Fall 1723: he went to Edo. 11th lunar month of 1723: the took the name of Hayakawa Shinkatsu, became wakaonnagata and performed at the Moritaza in the kaomise drama "Yorimasa Kaikeizan". 1st lunar month of 1724: Shinkatsu's rank in the Edo hyôbanki, wakaonnagata section, was jô-jô (superior - superior). He played in the same theater the role of Nagai Emon's nyôbô Hanazome in the new year drama "Keisei Wakaebisu". 3rd lunar month of 1724: Shinkatsu's rank in the Edo hyôbanki, wakaonnagata section, was jô-jô-hankichi (superior - superior - half excellent). 11th lunar month of 1725: Shinkatsu performed at the Ichimuraza in the kaomise drama "Semimaru Onna Moyô". 11th lunar month of 1726: Shinkatsu performed at the Ichimuraza in the kaomise drama "Hinazuru Tokiwa Genji", which welcomed in Edo the Kamigata actor Arashi Sangorô I. 1st lunar month of 1727: Shinkatsu's rank in the Edo hyôbanki, wakaonnagata section, was jô-jô-(hanshiro)kichi (superior - superior - almost excellent). 11th lunar month of 1727: Shinkatsu played at the Ichimuraza the role of Takehara Nyûdô's daughter Princess Toyo in the kaomise drama "Goshozome Kôyô Gunki", which celebrated the return in Edo of the actor Bandô Hikosaburô I. 3rd lunar month of 1728: Shinkatsu's rank in the Edo hyôbanki, wakaonnagata section, was jô-jô-(shiro)kichi (superior - superior - (white) excellent). He shared the same rank with Sodesaki Miwano I and Kirinami Onoe. 1st lunar month of 1729: Shinkatsu played at the Moritaza the role of Princess Omodaka in the drama "Higashiyama Chôseiden", which welcomed in Edo the Kamigata actors Yamamoto Kyôshirô I and his father Yamamoto Hikogorô. 1st lunar month of 1730: Shinkatsu's rank in the Edo hyôbanki, wakaonnagata section, was jô-jô-(hanshiro)kichi (superior - superior - almost excellent). He shared the same rank with Ogino Izaburô I, Sodesaki Miwano I and Sodesaki Iseno I. 11th lunar month of 1730: Shinkatsu played at the Moritaza the role of Sadatô's sister Onoe-no-Mae in the kaomise drama "Kankatsu Michinoku no Miyako"; the role of Abe no Sadatô was played by Sakata Hangorô I. 11th lunar month of 1731: Shinkatsu played at the Ichimuraza the role of Shikitae in the kaomise drama "Higashiyama Dono Eiga Butai"; his stage partners were Ôtani Hiroji I, Bandô Hikosaburô I, Yamamoto Hikogorô, Ichimura Takenojô IV, Sakata Hangorô I, Sanjô Kantarô II, Segawa Kikujirô I, Sodesaki Iseno I and Ichikawa Sôzaburô I. 11th lunar month of 1732: Shinkatsu performed at the Ichimuraza in the kaomise drama "Tsuwamono Kongen Hiru-ga-Kojima". 11th lunar month of 1733: Shinkatsu performed at the Ichimuraza in the kaomise drama "Shôhon Taiheiki". 1st lunar month of 1734: Shinkatsu's rank in the Edo hyôbanki, wakaonnagata section, fell to jô-jô-hankichi (superior - superior - half excellent). He shared the same rank with Sodesaki Iseno I. He played in the same theater the role of Tomoe Gozen in the new year sogamono "Jûhakkô Imayô Soga". 11th lunar month of 1734: Shinkatsu played at the Ichimuraza the role of Kiyohara Iehira's nyôbô Asaka in the kaomise drama "Michi-no-Ku Yunzei Genji". 3rd lunar month of 1735: Shinkatsu moved to the newly-reopened Kawarasakiza, the hikae yagura of the Moritaza which went bankrupt. He performed in the drama "Isaribune Reigen Irumagawa", sharing the stage with the zamoto Kawarasaki Gonnosuke III and the actors Sakata Hangorô I, Tsuruya Nanboku I, Yamashita Kametarô, Sengoku Hikosuke I, Edo Shichidayû and Sodesaki Miwano I. 11th lunar month of 1735: no record in any Edo kaomise. 11th lunar month of 1736: Shinkatsu performed at the Ichimuraza in the kaomise drama "Izu Genji Hôrai Yakata", which celebrates the arrival in Edo from Kyôto of the actor Tomizawa Montarô I and the shûmei of Tsuruya Nanboku II. 1st lunar month of 1737: Shinkatsu's rank in the Edo hyôbanki, wakaonnagata section, fell to jô-jô-(shiro)hankichi (superior - superior - (white) half excellent). 11th lunar month of 1737: Shinkatsu performed at the Ichimuraza in the kaomise program "Genji Kumo Ôgi no Shiba", which celebrates the shûmei of Ichimura Uzaemon VIII; the others stage partners are Sawamura Sôjûrô I, Bandô Hikosaburô I, Tamazawa Saijirô I, Tomizawa Montarô I, Matsumoto Kôshirô II, Kamakura Chôkurô II and Tsuruya Nanboku II. 3rd lunar month of 1738: Shinkatsu's rank in the Edo hyôbanki, wakaonnagata section, was jô-jô-(shiro)kichi (superior - superior - (white) excellent). Shinkatsu played in the same theater the role of Kajiwara's mekake Shinobu in the new year sogamono "Ukematsuri Manbai Soga"
11th lunar month of 1738: Shinkatsu played at the Ichimuraza the role of Ômori Hikoshichi's sister Umezono in the kaomise drama "Mitsugibune Taiheiki". 1st lunar month of 1739: Shinkatsu's rank in the Edo hyôbanki, wakaonnagata section, was one black stroke above jô-jô-(shiro)kichi [visual]. 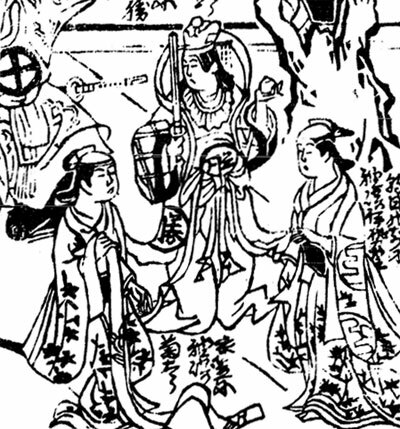 He was also the kanjiku for the onnagata actors in the 1739 Edo hyôbanki. 11th lunar month of 1739: Shinkatsu performed at the Ichimuraza in Fujimoto Tobun's kaomise drama "Tokiwagi Taiheiki". 1st lunar month of 1740: Shinkatsu's rank in the Edo hyôbanki, wakaonnagata section, was jô-jô-(shiro)kichi (superior - superior - (white) excellent). He was also the kanjiku for the onnagata actors in the 1740 Edo hyôbanki. 6th lunar month of 1740: Shinkatsu performed in the same theater in the drama "Amida-ga-Ike Imose Kagami"; this is his last appearance on stage. He stopped acting and became a Nagauta musician, performing under the name of Hayakawa Shinjirô. 27th day of the 12th lunar month of 1754 : he died in Edo. Hayakawa Shinkatsu was a popular onnagata actor, born and trained in Kyôto, who was active in Edo from 1723 to 1740, mainly at the Ichimuraza (11 seasons) and at the Moritaza (4 seasons). He was also a talented shamisen and, in his latter years, he stopped acting to perform in Nagauta ensembles, mainly at the Nakamuraza (where he never performed as an actor!). Another possible reading could be Hayakawa Shôsaku. The 27th day of the 12th lunar month of the 4th year of the Hôreki era was the 7th of February 1755 in the western calendar.